As much as you might want to believe that you’ve never met a psychopath, the truth is, they can be pretty good at blending in. 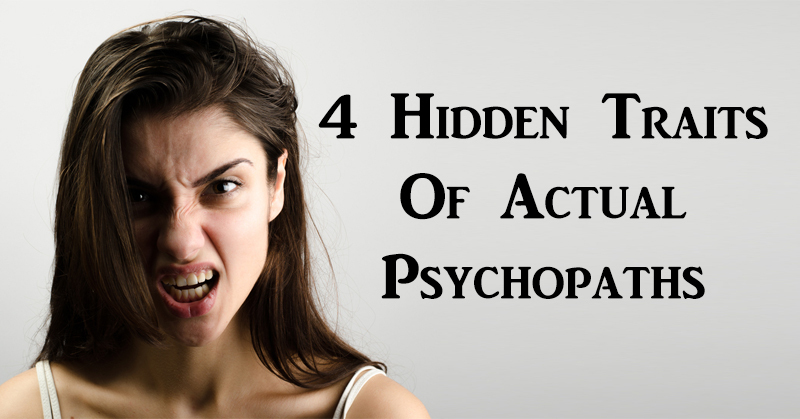 Psychopaths aren’t just serial killers in horror movies. They actually exist. In fact, experts believe that psychopathic behavior in the general population is about 1 in 100. If you interact with others on a regular basis, chances are you’ve run into at least one psychopath at some point in your life, maybe more. Psychopaths don’t always appear with beady eyes and jagged scars on their face (thanks TV). They can be hard to spot, and many are even likable at first. That’s why it’s important to know what you’re looking for. One of the reasons that psychopaths are hard to identify is because many leave a good first impression. This is because they are experts at fooling others. They have the ability to draw people in, but they are unable to sustain a long-term relationship with others. Their quick wit and charm might have you fooled at first, but after you get to know them you’ll see a whole other side. Psychopaths see manipulation as a game. They enjoy using it as a tool to get what the want from others. They test boundaries and limits to see how far they can go. They don’t mind hurting others, so they have no problem taking it as far as they need to in order to achieve their goal. Sometimes, their goal is simply to see another person at their breaking point, and to be the cause. Psychopaths don’t feel remorse for their actions, which is why their have difficulty showing emotion. If you notice someone has a complete lack of guilt, it’s a sign you might be dealing with a psychopath. This is often accompanied by blaming others and refusing to take responsibility for anything. A psychopath will use their manipulation technique to twist your words and turn situations around so they are never the one to blame. Extreme arrogance is another major sign that you’re dealing with a psychopath. Of course, there are plenty of arrogant people. But psychopaths show an extreme level of arrogance. They have an inflated sense of of self importance. Psychopaths believe they are better than everyone and everything. They believe they deserve more than others, due to their superiority. They often make unrealistic claims about their achievements and talk about themselves in an extremely arrogant light. They see the people around them as inferior, and they have no problem stepping on them to get what they want.